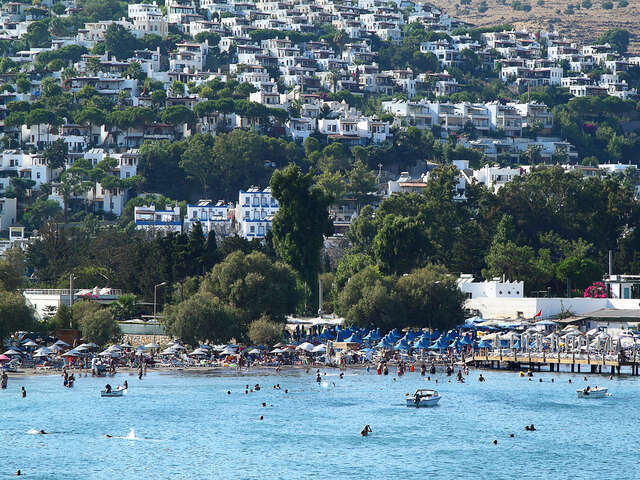 Bodrum is a Turkish port town in Muğla Province, in the southwestern Aegean Region of the country. It is located on the southern coast of Bodrum Peninsula, at a point that checks the entry into the Gulf of Gökova, and it faces the Greek island of Kos. Today, it is an international center of tourism and yachting. The city was called Halicarnassus of Caria in ancient times. The Mausoleum of Mausolus, one of the Seven Wonders of the Ancient World, was here. Bodrum Castle, built by the Crusaders in the 15th century, overlooks the harbor and the International Marina. The castle grounds includes a Museum of Underwater Archeology and hosts several cultural festivals throughout the year. 5 Things You Need To Know About Bodrum 'Halicarnassus of Caria' was the ancient name given to the present day Turkish city of Bodrum that is located on the entry into the Gulf of Gökova. It was previously popular for being home to Mausoleum of Mausolus, one of the Seven Wonders of the Ancient World.